Reproduction of the original Le Mans 24 Hours of Le Mans Race Poster. This reproduction of the official 1924 poster is officially endorsed by the A.C.O. This poster is after a color illustration by an unknown artist while the overall design was in the hands of the Ch. Hirvyl publishing house of Angers. As the 1923 race did not attract a huge crowd, the 1924 poster stressed the party aspect and downplayed the race itself. 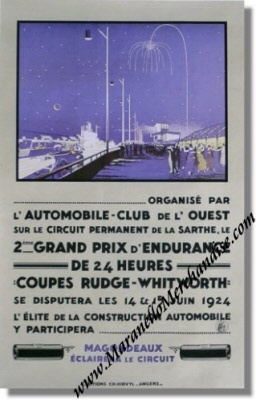 The night was again the main feature as it singled out the Le Mans event from the other French races. There was some discreet advertising (Magondeaux eclairera le circuit) and the elitist choice was clearly stated with its lavish party and the mention "The elite of the car industry will take part in it.". For the full results of this race, please see 24 Heures du Mans results 1924.